Goodbye, MacBook Pro. The New MacBook Air Is That Good. 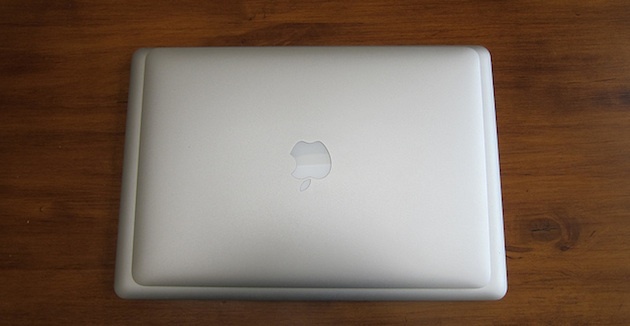 Last Wednesday, I got my hands on one of the new MacBook Airs. I haven’t touched my MacBook Pro since. It’s six months old. RIP. I know that sounds outrageous. Or like hyperbole. But it’s not. When I wrote up my initial thoughts, it was after only a few hours of usage. I hadn’t even used it outside the house yet. But now I have. I’ve used it almost everywhere I’ve been for just about a week now. There’s no question in my mind that this has replaced my MacBook Pro as my go-to machine. But here’s the really crazy thing. It’s not just the size of the thing that I love so much (I have the 13-inch model) — which is amazing — it’s the speed. This thing boots up in less than 15 seconds, ready to go. My i7 iMac with 8 GB of RAM takes something like 2 minutes. My i7 MacBook Pro takes at least 30-45 seconds, and it has an SSD drive. Applications seem to load quicker. Files transfer quicker. The thing shuts down in about 3 seconds. Macworld has the initial benchmarks. They don’t lie. It just screams. And by speed, I also mean “power”. Remarkably, for the first time that I’ve used one, this MacBook Air doesn’t feel underpowered. At all. Again, for the past 6 months I’ve been using a combination of an i7 iMac and an i7 MacBook Pro. Judging from processor, clock speed, and amount of RAM, both should be significantly faster than this Air. For certain tasks, they undoubtedly are. But for pretty much everything I’ve done this past week — basically, my regular work and play habits — I really can’t say I notice a difference. This definitely surprised me. Again, Macworld’s initial benchmark numbers seem to at least partially back up such a crazy claim. I have the baseline 13-inch MacBook Air with a 1.86 GHz Intel Core 2 Duo processor, 2 GB of RAM, and a 128 GB flash storage hard drive. Their tests have this thing performing better than the 13-inch MacBook Pro with a faster Core 2 Duo processor and double the RAM. And it’s not that far off from the i5 Pro model. They largely credit the flash storage hard drive. And that’s undoubtedly a huge part of the performance. But another part is likely that previous MacBook Airs have run underclocked to deal with heat issues. That doesn’t appear to be happening with these models. So they can purr along at full speed. And it shows. Earlier tonight, Daring Fireball’s John Gruber wrote a post wondering where this new Air fits into Apple’s MacBook lineup? It is a good question considering the base model is the same $999 price as the base MacBook model. He thinks it might fit in as a secondary computer. I agree — for now. There is one thing holding back the Air: storage space. Thanks largely to Apple themselves, we live in a world where we have digital music, photos, movies, and TV shows that take up dozens, if not hundreds of gigabytes of storage. Because of this, a 128 GB hard drive isn’t enough for many people these days if they’re going to be using the Air as their primary machine. Increasingly, even 256 GB isn’t enough. Hell, I’m nearing 1 TB of media on my iMac. But. We all know that Apple has aspirations to move all of this media to the cloud. If they can do that and cut the chains around these machines, they’re going to fly. Off the shelves. In a hurry. Here’s how I see it: if storage didn’t matter, I think this 13-inch MacBook Air would almost immediately be Apple’s best-selling Mac. It’s that good. I can’t speak to the 11-inch model, as I haven’t used it, but it’s getting rave reviews as well. 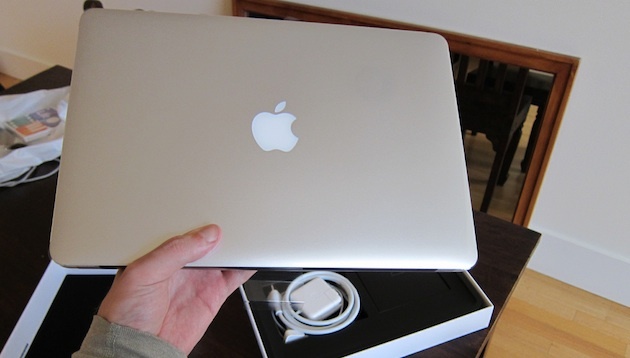 The 13-inch model I’m talking about here is the base model which is $1,299. The 11-inch models start at $999. It’s funny that I haven’t really even talked about the size of the machine yet — that’s the glittering lure that ropes people in. But the Air has always had that. What it didn’t have previously was a great price and killer performance. Now it does. Just in the past six days, five people that I’ve showed this thing to have already bought one. That’s the stuff iPhones and iPads are made of. It has the “wow” factor. And regardless of if storage capabilities hold it back or not, I have no doubt that the Air does point to the future of the MacBook lineup. They’re soon all going to lose their optical drives, gain flash storage drives, and work for hours on end. In fact, the only machine I can think of that I might enjoy more than this one is one that lasts even longer. To get that, I’d accept a model that’s slightly larger (15-inches), slightly heavier (maybe 3.3 pounds), but had 10 hours of battery life. That’s the future MacBook Pro right there. Speaking of battery life, again, this thing shines pretty nicely in that category as well. Apple says it will get 7-hours, and based on my usage, that’s close. I’m usually seeing between 5 and 6 hours depending on what I’m doing and screen brightness. A couple times I have gotten about 7 hours. As for the supposed 30 days of standby time? It’s hard to imagine me not using this thing for 30 days at a time, but I will say that I’ve gone to bed with it at 50 percent power and woken up several hours later with it at 49 percent power. And yes, the thing wakes up from sleep instantaneously. The only thing you have to wait for is for your WiFi to connect. As for the screen? Again, I thought it would be an issue switching from a 15-inch MacBook Pro to this, but it’s really not. This thing has the same 1440-by-900 resolution as the standard 15-inch MacBook Pro screen, so, there you go. People also can’t seem to believe when I tell them it doesn’t run hot. But it doesn’t. The only times I’ve felt it getting a little bit warm is when I’ve run — surprise, surprise — multiple Flash movies. But the heat doesn’t come close to my MacBook Pro. That doesn’t come close to my old MacBook Pro which was an upside down stove at points. It’s hard to know what else to say. This is the computer I’ve been waiting for. It makes me feel foolish for spending almost three grand on a brand new souped-up MacBook Pro six months ago. I just can’t think of a time I’ll ever want to or need to turn it on again. Goodbye, MacBook Pro. Your candle burned out long before your hard drive ever did.